A state-of-the-art manufacturing process makes All-Nutrient Cream Hair color new and unique. All-Nutrient Hair color is made in the USA from organic products in a vacuum system — that’s the way quality skin creams are made. This vacuum system removes air from the cream base that can cause oxidation contaminating hair color and decrease penetration. All-Nutrient Cream Hair color is made in a natural base of pure vegetable oils and silk protein to allow gentler penetration of color pigment, ensuring greater depth of color, long-term durability and healthier hair. All-Nutrient Hair color was proudly recognized by Modern Salon’s April 2008 issue as a top “Green Product” for being formulated from certified-organic ingredients! The All-Nutrient hair color system is a superb option for those needing a mild ammonia product, containing certified organic ingredients that is low in PPD (Para-Phenyline Diamine) and PH balanced for superb, gentle results. Going organic isn’t just great for the environment; it avoids the burning, itching and harsh chemical fumes of traditional hair color. 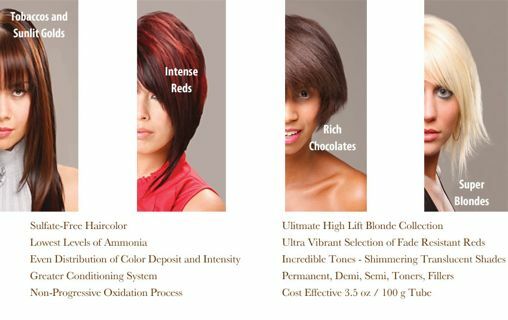 All-Nutrient Hair color is definitely an all-in-one hair color system with seemingly endless benefits. This cream hair color provides 100% gray coverage, the most natural looking neutrals, an ultimate high lift blonde collection and an ultra vibrant selection of reds. It also offers extremely consistent and predictable results. All-Nutrient offers incredible opaque tones as well as shimmering translucent shades with calibrated hair color that makes mixing easier and a cost-effective hair color for salon professionals. Permanent, semi-permanent, demi, toners, fillers and temporary hair color are all now available. All-Nutrient Shampoos establish a new standard of excellence with the simple, yet all-important aspects of preventive hair care – gentle, plant-derived cleansing and moisturizing. This breakthrough professional salon technology uses a plant-derived system to gently cleanse the hair and scalp and to protect the hair against dryness. Your hair is left shiny, manageable and ready to style.